I wanted to take a moment to share with you my thoughts on Mobile Technology for Real Estate Agents. Whether you have accepted it or not, Real estate has gone and will continue to go MOBILE. As a matter of fact, I believe in the next 3 to 5 years, Our business will be done mainly from a mobile device vs a Desktop PC or even a laptop. I also believe that in that same timeframe we will be accessing the Internet more from a Mobile Device than a PC. This is mainly due to the evolution of the smartphone, Tablets and APPS. Apps are going to Drive this NEW evolution. From the Iphone App store to the Android marketplace to the Blackberry App world. 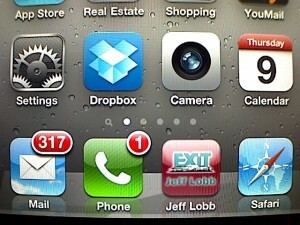 I wanted to give you my thoughts about personal apps for Real Estate Professionals. Many companies I see come out with an IPHONE app and get really excited about that. But I look at it this way. If you have Just an Iphone app, what message does this send to all of the Android, Blackberry, Windows mobile or ANY of the other Hundreds of mobile devices out there?? They don’t Matter !? So I have taken a Different Mobile Direction. I went with a Mobile Solution that can take my regular Website www.jefflobb.com and make that not only a mobile site, BUT it gets optimized to fit the screen of ANY mobile device in the World . PLUS it creates Gateway APPS for all three major app devices such as IPHONE, ANDROID (coming in 1 mth) and Blackberry. It is such a smart technology that it not only knows that your device is a blackberry, it knows its a Blackberry 9800! Then instead of having to get apps from the APP stores, you get the Gateway APP right from MY mobile site. This to me is Awesome and a great solution. Now , it can be a mobile Profile site for all of your info OR it can be a full IDX mobile search site for Real Estate Search. The company I have chosen to use for this technology is Mobile Card Cast They can Design a custom APP for you, your Brand or your company website to mirror your branding campaign. I am really excited to show you my new mobile profile site, so please go check it out and let me know your thoughts. 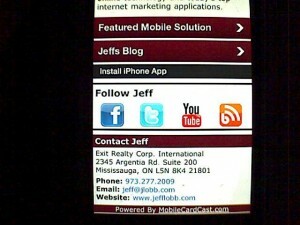 From any mobile device goto www.jefflobb.com (Android app coming soon) or you can get text codes too like TEXT LOBB to 88500. Go for it, and get more mobile !